The last day of the Stockholm Convention, ushered some good news for all those crusading against endosulfan in India. Endosulfan has finally been brought under the Annex A of the Stockholm Convention, which means that Endosulfan should be banned globally. Union agriculture minister Sharad Pawar is rooting for endosulfan just before the fifth Conference of Parties (COP) of the Stockholm Convention meets in Geneva from April 25 to April 30 to decide the fate of the pesticide. There seems to be a pattern in Pawar’s resistance to banning endosulfan. Replying to a question in the Lok Sabha on February 22, the minister misled the House and said many states did not want a ban on the pesticide. India softened its stand and agreed to the listing without any opposition. This was a welcome move as India had become almost notorious for opposing any ban on endosulfan in the international arena ever since it was introduced as a persistent organic pollutant in the fourth Stockholm Convention in 2008. Endosulfan has been listed under Annex A of the Convention, with exemptions, meaning a global ban of all production and use within 5 years. This 5 year period can be extended to a maximum of 10 years. After that it will take another one year for the ban to be executed. India, China and Uganda, are the only three countries that have asked for exemptions and these are for certain pests on cotton, coffee, tea, jute, apple, tobacco, cow peas, beans, tomatoes, okra, eggplant, onion, potatoes, chillies, mango, gram, arhar, maize, rice, wheat, groundnuts and mustard. For the majority of countries, not asking for exemptions, the ban takes place within one year. India now has to ratify its decision in a cabinet meeting and convey it to the Stockholm Convention so that the exemptions and financial support will be made available to India. Though there is a global ban India has asked for an exemption for pests in 14 crops, which is effectively for all the crops for which endosulfan has been registered with the Central Insecticides Board. Although in the immediate future, there might not be a stark reduction in the use of endosulfan but this is definitely a way ahead towards an eventual ban. “The efforts also assure that the Stockholm convention POP Review Committee will work with parties and observers to come up with alternatives. Further it is also decided that the convention will provide financial assistance to the developing countries to replace endosulfan with alternatives,” said C Jayakumar of Thanal, who was attending the Geneva conference as an observer from India. Simultaneously back home, the agriculture ministry on April 27 wrote to all the states to seek their view on the use of endosulfan. On April 28, Farmers Welfare and Agriculture Development ministry of Madhya Pradesh, in a letter to the central agriculture ministry, registered its support to Kerala to ban the pesticide. This was followed by the Kerala chief minister VS Achuthanandan's plea to all the other chief ministers to support a ban on endosulfan and write to the centre. April 29th was the last day for the Stockholm Convention at Geneva. Talks opened with a discussion on the continuation of DDT. DDT is currently listed under Annex B of the Stockholm Convention. Listing in Annex B means that the chemical/pesticide has to be phased out eventually; it is banned with certain exemptions and till such time that an alternative can be found. In India DDT is being used only as a vector disease control. India on its part reported that they were producing DDT under strict control and that the use of the chemical has come down to half from 10,000 metric tonnes in 1997 to 5,500 metric tonnnes in 2010. On the other hand, endosulfan was discussed by the contact group on new POPs of the Stockholm Convention and is inching towards a global ban. What needs to be seen is whether it makes it to Annex A, which means a complete ban or Annex B, which means a phase out that is time bound. The contact group on endosulfan was chaired by Qatar. The news trickling out of the convention is that there is a document on endosulfan that has been prepared which might become the final document after a few edits and will be presented to the plenary for a decision, most likely on day 5. The draft document of the contact group takes note of the recommendations by the POPRC to list technical endosulfan, its related isomers and endosulfan sulfate in Annex A of the convention, with specific exemptions. The group is yet to deliberate on pest-crop complex and the countries that have requested for the exemption. India is one of the countries that have requested for an exemption. China is backing it. Earlier Samoa too had called for suspending the proposal of listing endosulfan till a cost effective alternative could be worked out. The Indian delegation, that has been harping on FAO reports that showed endosulfan was not hazardous, however received a jolt when FAO refuted India's claim and stated that endosulfan is a hazardous pesticide. C Jayakumar of Thanal who is at Geneva as an observer said that though he was hopeful, one cannot be sure of the strategy of the Indian industry. “They could either get India to change its position or get a small country to block and delay the decision,” he said. It is most likely that the decision will be taken by consensus and not a vote. For one, the pesticide lobby was heard spreading rumors that the observers from Kerala, C Jayakumar of Thanal and Mohammed Asheel of Kerala Health Services were separatists and thats the reason why Kerala had a separate opinion. “Many countries came to us saying that these messages were being spread about us,” said Asheel. However, all eyes are now set on Day 5 and the discussion in the plenary session. As Day 3 of the COP-5 at the Stockholm Convention proceeded, there were discussions on the alternatives and exemptions of endosulfan in the contact group of the convention. On day 2, the POPRC chair introduced POPRC's recommendation to list endosulfan in Annex A with specific exemptions as was recommended by consensus of the POPRC members in October last year. India had said that data was needed on non-POPs alternatives to endosulfan. They also added that the decisions by POPRC on such substantive issue should be consensus-based and not vote based. They added that financial assistance for implementation of current obligations should be secured prior to listing new chemicals in the Annex. The Indian delegation comprised of Gauri Kumar, additional secretary (MoEF), Rajiv Gauba, joint Secretary (MoEF) , Chanda Choudhary (MoEF) and Vandana Jain (MoA) and T Basu of Hindustan Insecticide Limited. From the non- official delegations corner, there were extreme responses. The Indian chemical lobby represented through the Indian Chemical Council and a non-profit International Stewardship Centre opposed the listing of endosulfan. The former emphasised that there was insufficient scientific evidence to list endosulfan in Annex A. The International Stewardship Centre said that the proposed alternatives to endosulfan were not affordable and that its listing would be detrimental to farmers. On the other hand organisations like Thanal, Inuit Circumpolar Council, Pesticide Action Network and FAO, welcomed the proposed listing of endosulfan in Annex A, noting the severe health effects on farmers and indigenous peoples. On the sidelines, non-profits from across the globe, including Kerala, have set up 'The Annex A cafe' that serves endosulfan-free organic coffee, cashew nuts and chocolate to the delegates of the Convention in Geneva. The cafe has on its menu organic coffee from Brazil, Indonesia, Ethiopia, Costa Rica, Mexico, India, and other countries; organic cashew nuts from India; chocolate made from organic cocoa from various Latin American nations and organic tea from China, India and Sri Lanka. The NGOs serving the delegates wear T-shirts made from organic cotton grown in India, provided by Pants2Poverty, a company which sources organic cotton from India and West Africa. Some of these produce come from Sahaja Aharam of the Centre for Sustainable Agriculture in Andhra Pradesh. Many other food items, such as soybean and sugarcane, grown without applying pesticides are also on display at the cafe. 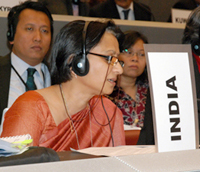 In the ongoing plenary of COP5 of the Stockholm Convention at Geneva, India was in for a bit of a shock on day two. India's efforts to present its statement as a joint statement of the Asia Pacific region failed miserably as a few countries wanted to delete the parts in the document referring to endosulfan. India had circulated a document on day one during the regional meetings stating that endosulfan was not a health hazard and that the sixth POPRC’s recommendation of endosulfan in Annex A was a serious procedural violation. “Bahrain, Qatar and Jordan were not in favour of including paragraph 7 of the document, the part that says that the significant health hazards and environmental impact of endosulfan is not yet established. They want all references pertaining to endosulfan be dropped from the document,” said Mohammed Asheel, observer at the Stockholm Convention. However India is still trying to garner some support on other fronts. It had mentioned it in its document that the decision of the COP should be based on consensus and not on voting as it set a bad precedent undermining the cooperative character of the convention. The Indian delegation is now trying to present it as the issue of sovereignty of developing countries and urging other countries to resist voting. In case of a consensus, India can resist the ban alone, something which might not be possible in case of a voting. Endosulfan has been banned or is in the process of a phase out in nearly 81 countries. The Stockholm Convention is meeting to arrive at a consensus, amongst other things, to include endosulfan in Annex A of the convention as was recommended by the sixth meeting of the Persistent Organic Pollutant Registration Committee in October last year. Listing of a chemical in Annex A would mean that the pesticide should be completely eliminated. On the other hand, Kerala chief minister VS Achuthananadan’s day long fast demanding a national ban on endosulfan has not gone unnoticed in the diplomatic circles at the Stockholm Convention. “Diplomats from other countries said that they hoped this fast would have an impact on the stand that India has been taking and that it would co-operate instead of opposing the ban,” wrote C Jayakumar of Thanal, a non profit in Kerala, in an e-mail. Jayakumar is at Geneva as an observer of the Stockholm Convention. 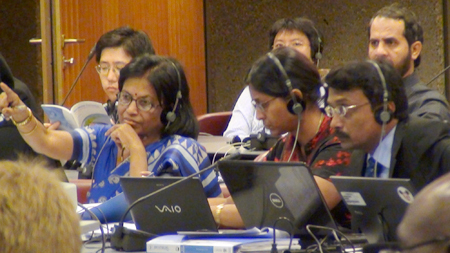 The ongoing five day COP5 meet of the Stockholm Convention concludes on April 30. 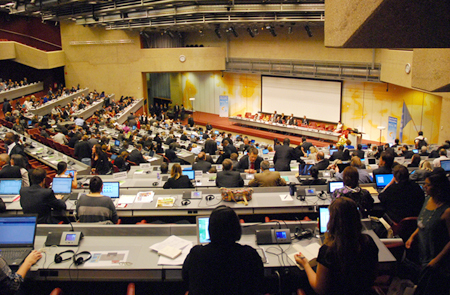 The five day plenary session of the Stockholm convention began in Geneva today. The new chair for the COP meeting, from the Czech Republic, has been selected. The main meeting on endosulfan will begin on Tuesday. On day one India distributed its statement at the regional (Asia Pacific) meeting. It still claims that Endosulfan is not a health hazard and that its recommendation in the Persistent Organic Pollutant Registration Committee-sixth meeting was based on selective data and contrary evidence from other studies including FAO and WHO. India is trying to push the Asia Pacific region into toeing its line and present the draft document as a statement from the Asia Pacific region. But it is unlikely that most countries, barring those over which India has diplomatic influence, will follow India. Though status of countries like China and Israel, the other big producers is still not clear, countries like Thailand and South Korea are unlikely to accept the statement. The Indian statement has been harping on the fact that any decision on substantive matters like banning a chemical in the Stockholm Convention should be reached at by a consensus and not a vote. A voting is permitted under the Convention rules and India is worried that they will lose out if the COP decides to vote. In its statement India has urged the COP to decide on the fate of endosulfan only after cost analysis, technical feasibility and socio-economic consideration of the alternatives are done and the issue of adequate financial assistance has been solved. The African countries are more or less talking about a common agreement of adding endosulfan to Annexe A of the convention with out exemptions. The same is the news from GRULAC- Group of Latin American and Caribbean countries has agreed to the same position as that of the African countries and are asking for financial resources to implement the addition of endosulfan to the Stockholm convention. These are three important groups, including Asia Pacific. However, two more groups that of Eastern Europe and a group of the developed countries have not yet come up with their statements. Back home, the Kerala Chief Minister VS Achuthanandan, went on a day long hunger strike at the state capital demanding a nationwide ban of endosulfan and assistance from the centre for the victims of Kasaragod. This was held to coincide with the first day of the meeting at Geneva. The cM also lashed out at the prime minister for not taking a pro people decision despite the proof that endosulfan is hazardous for humans and ecology alike. No alternative of Endosulfan, after ban on endosulfan what should be alternative for farmar.Endosulfan is low cost pesticed and Honey bee friendly which use ful for crops. ans that for it is call " Dosto ka dost Dusmanoka duman "
Good efforts by Indains.keepit up. Endosulfan should be banned. No pesticeds are good for any living creatures. The worst affected creatures die,ie,pests, the rest survive somehow. And for endosulfan, the pests die and human being decay and die. First time in my life here I go against my own country for support of 2 of its worst affected states and rest of 81 countries in the world. No idea of what he talks..
Technically it is proved that ENDOSULFAN is harmful to the people and environment. Then the furtehr step should be to look for the changes in the same or alternative for the presuppose it is developed rather than making it as a political issue. Once the impact of Endosulfan is tested in the lab then guess or impression of any individual or unit should be irrelevant and should not be given weightage irrespective of their position. The present argument is the clear cut gap between the LAB to LAND which affects the process of transformation of technology to the grass roots. The out come is encouraging and all the stakeholders should support for the cause. Looking forward to get the best for the cause or purpose.